Winter trees laden with snow in the Annapolis Valley. January is the time to get out and enjoy winter in Nova Scotia. It may be cold but for sporty people, there’s no shortage of activities. Go downhill skiing at Ski Wentworth in the Wentworth Valley, Ski Ben Eoin in Cape Breton or at Martock in the Annapolis Valley. You can go cross-country skiing too, at the private resorts or at dozens of parks across the province. If skiing isn’t your thing, how about snowmobiling? There are 3,500km of snowmobile trails in the province. Find out more about trails and local clubs from the Snowmobilers Association of Nova Scotia website. There’s also skating and snowshoeing to consider or just relaxing by the fire in a chalet. Hearty souls can even try winter camping in Kejimkujik National Park or birdwatching. You might spot a bald eagle! Winter is a great time for photography. 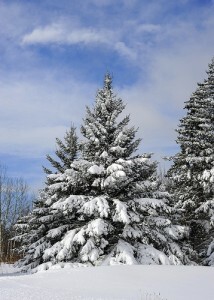 The white snow is beautiful on the landscape and is often accented by a vibrant blue sky. Music fans will want to check out the In The Dead Of Winter festival in Halifax at the end of January. Don’t forget to allow extra time to drive around the province. The cold weather means snow and icy roads can make getting around difficult. And of course you’ll want to book accommodation if you’re planning to visit over the New Year holiday, when hotel space is at a premium.